The history of consulting begins with the first ‘intervention’ of the serpent in the Garden of Eden, and today’s consultants have just as dubious a reputation. Consulting is constantly accompanied by temptations and risks. The temptations include flattery, over-assessment of one’s own abilities, and sarcasm, while the risks include responsibility without authority, uncertainty about one’s own contribution, and loss of control. Yet consulting begins with the right state of mind. And Fearless Consulting clearly demonstrates that, in spite of the many risks and temptations, if you first fully understand your intention as a consultant you will be equipped to approach your clients boldly, confidently and without fear of failure. Drawing on inspirations from diverse sources including history, tragedy, philosophy and of course consultants themselves, Erik de Haan asks you to think about what it means to be a consultant and the dilemmas it can entail. He then offers guidance on how to formulate your own views about the nature of the profession, and choose your own approach from a toolkit of specific intervention models and practical methodologies. 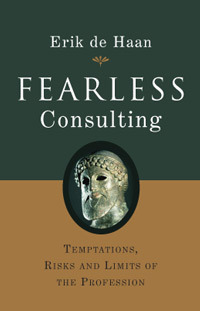 Intellectual and inspirational in equal measure, Fearless Consulting is essential reading for anyone who regularly consults to others and wants to know more about this fascinating profession.